The Rook is back! Bill DuBay's time-traveling adventure comic returns, penned and illustrated by comics masters Steven Grant and Paul Gulacy! Restin Dane is ready for action-anyplace, anytime! 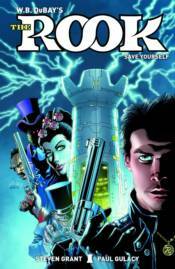 Collects the Dark Horse Comics series The Rook #1-#4.